There's something about you. You try to blend in but people can tell. No, you don't smell. It's something much more subtle, something that suggests you've got a power that no one else possesses. Let's see, have you ever walked into a candlelit room and watched as the flames first sputtered out then flamed up? Have you ever noticed that cats, especially black ones, are strangely drawn to you as if you stuff your pockets with salmon? Which, you don't, right? That's not whimsical, that’s just weird. If you walked into a Voodoo shop you just might find that you get a little extra respect when you're buying supplies for love potion number nine. It's one thing to dabble in Voodoo but it's another to be born with that magic in your blood. Maybe they didn't tell you about the moon turning red on the night you were born, that's a little spooky. 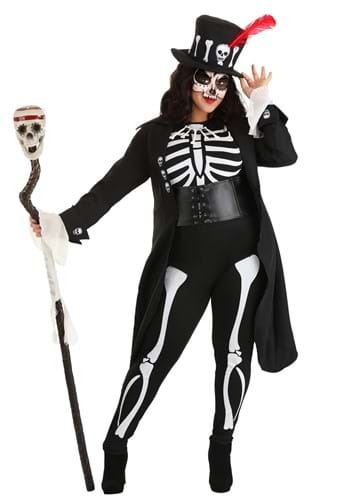 It's about time you embraced that intangible feeling that's been following you all these years and what better way to do that than dressing up in this Voodoo skeleton costume? You'll feel connected to that mysterious magical feeling when you're wearing this ensemble. The jumpsuit is printed with a bright white skeleton which contrasts nicely with the coat with tails and black corset. Whether you're in a Dia De Los Muertos parade or you're simply dressing up for Halloween, your ensemble will be complete when you put on the bony top hat with a red feather. You've felt powerful inside for a long time, isn't it nice to be able to wear your voodoo feelings on your sleeve? While you might look like you can conjure the power of the other side, there's no need because this voodoo costume will transform you without having to appeal to any dark yet alluring magic.